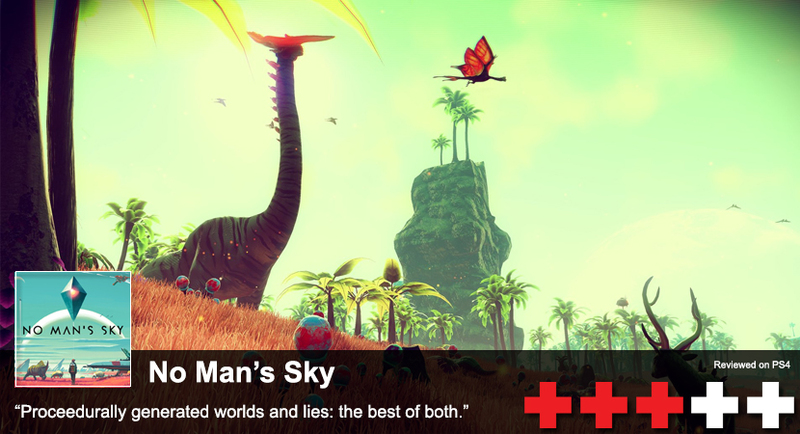 In 2014, Sean Murray came out on Sony’s E3 stage to show off the incredibly ambitious No Man’s Sky. After that announcement, gaming communities and publications started desperately searching for more information explaining what this game actually was. The level of secrecy and perceived grandiose design surrounding No Man’s Sky generated a level of hype that could only led to some disappointment along the way. Irregardless of what the fans imagined No Man's Sky was going to be, now that it's been released we see what it truly is; a survival game with procedural generated content in an incredibly gigantic universe. The game opens as you travel through the universe, while random galaxy names populate around you, as it finds the exact position of your avatar. Once you are brought into existence, you are free to explore the plant on which you have crash landed. Soon you are introduced to Atlas, a robotic guidance system that is similar to the Ghost from Destiny. 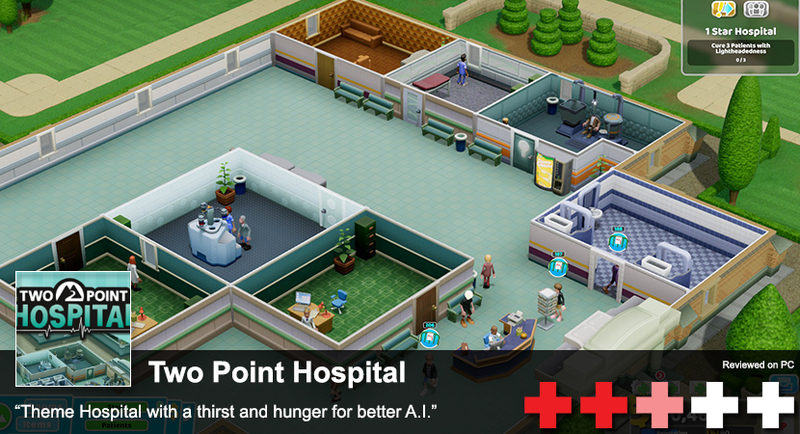 It helps guide you through various beginning objectives and waypoints to discover. Near your initial landing spot you will find a save point and a crashed ship, which is in dire need of repair. You set off, with a mining tool by your side, to explore this unknown planet. While exploring, you also find and gather resources, which are needed to repair the the ship. Your gun, scanner, and combat functions of the ship are all in need of repair as well. My personal experience with No Man's Sky was fraught with trouble from get-go. Since I pre-ordered the game, I was given a code for a ship that looked like an X-Wing clone. The game pestered me non-stop to redeem the code. So I did. It turns out, as I discovered while checking community websites to see where I could find antimatter, that if I redeemed my code before obtaining warp drive blueprints, I could not complete that task. This broke the quest string which I needed to follow in order to obtain other items in the game. Well that was no good, I had to start over. Usually starting over a game is no go, but I felt that since I had not accomplished much in my first few hours, I would give it another try. Most of my original play time had been spent learning the systems and what I needed to do to get going anyway. Not to mention examining every plant and organic species in my vicinity. So on my second play through, I had a basic idea of what I should be doing, so I was able to trim the time to get back where I was to about 20 minutes. Yes, unredeemed items. Got it! There are many types of resources to harvest for crafting. Though not every planet or galaxy has exactly what, or how much, you need. For example, the first planet I encountered was full of gold deposits, while the next had almost none. Since No Man's Sky randomizes what resources are accessible on each planet, you never know what you will find when you land. Superficially, the crafting system seems pretty basic. You locate blueprints through your travels by checking outposts, helping aliens, and solving small puzzles. However, the more time you invest, the more the game opens up. Collected resources are placed in small groups which results in plenty of micromanagement as your inventory starts out fairly small. That is until you can locate drop ships that have suit upgrades which include increased inventory slots. Also your crafted items and suit accessories take up inventory slots, which make your already limited space even more valuable. While this becomes less of an issue over time, as you increase your inventory size, in the beginning it is still quite annoying. I found myself trashing items that I could have turned in for credits – the game currency – to make room for items necessary to power my mining tool and fuel my ship. The planets in this game are large. So large in fact, you never really run out of available resources to harvest. It was not until I left my starter worlds atmosphere that I fully appreciated how massive each planet really is. You can not just run across the entire world in a few minutes of even hours. It would probably take days to go from one side of a planet to the other. That is the case for every single planet you can visit. 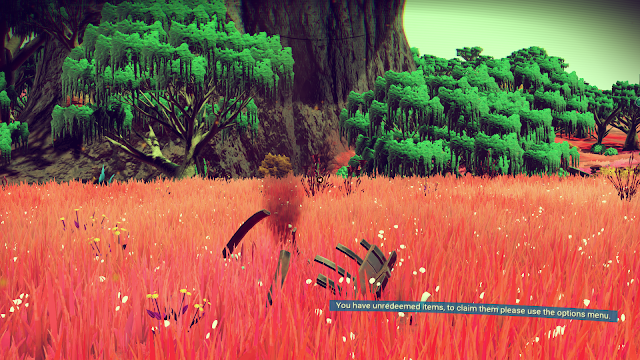 If you feel small in real life, you will feel microscopic in No Man's Sky. Everywhere you visit, from space to ground, there is something to do. While on a planet's surface you can; help aliens with various tasks, scan life forms and master botany, learn various words in languages from relics, mine materials, and search for blueprints and spaceships. In space, the game feels like a hostel trader world. Sometimes its filled space pirates who attack on site. This can be rather annoying as they will swarm you and it can be hard to get away. This usually happens in areas where freighters are warping in, carrying valuable containers of various tasty treats. Apart from the opening sequence and warping to a new solar system, traveling between planets is a seamless experience which feels incredible. 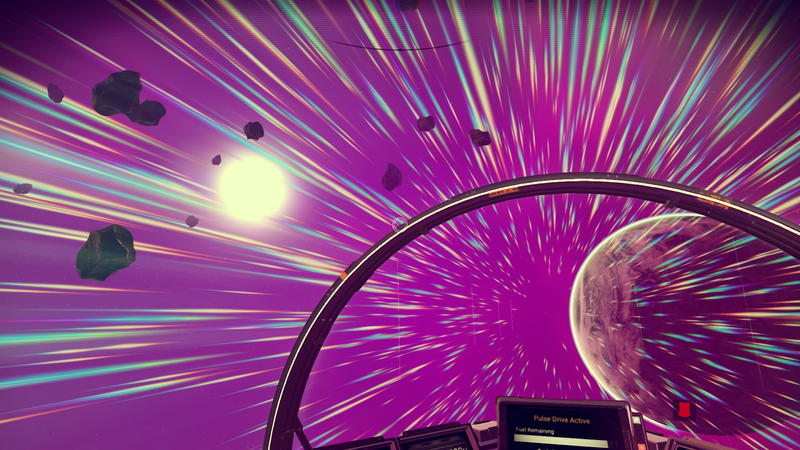 If No Man's Sky did anything exceptional, it is making you feel like you are truly traveling in a galaxy. Over time the novelty will wear off though, as there are over 18 quintillion planet to explore. Since there are not millions of different variable in planet life, animals, aliens, and atmospheres, you will eventually start experiencing repetition. In a galaxy far, far, far away. This can become a real problem if you are quickly jumping from planet to planet and just trying to “beat the game” rather than taking your time to fully explore what each planet has to offer. On the other hand, I spent 3-4 hours on a single planet just to see what it I could fine and I enjoyed that immensely. Also, the various quest and events offered on each planet can last you a good long while before needing to move on. It really just depends on what each gamer is looking to get from No Man's Sky. Personally, I hope they will patch in more variety with regard to how the worlds are formed and what goals each planet offers. It would also be nice to have more Earth-like planet, maybe with deranged dinosaurs or a few volcanoes. Creatures could also use some additional variety, as you will likely discover most varieties over a weekend of consistent playing. While I still find freakishly ugly Jurassic Park abominations from time to time, the more I play the less exciting I find the creatures to be. Also, they are not very intelligent and do not seem to serve any purpose other than background scenery. Botany is extremely boring as well. After exploring my third planet, I had discovered practically all variations of the modeled plant life. Maybe these issues will be address in future patches and help turn this game into the space Minecraft it deserves to be. It's the fabled Clogasaurus Taps! He's a dancer. Even with all the complaints, I still feel like I am greeted with something new or interesting which I had not noticed before. But as previous mentioned these is a lot left to be desired and it is far from a perfect game. There is evidence that some teased and promised features were purposely left out of the game. The most controversial of them is the lack of any type of multiplayer. Through Sean Murray was never clear on what multiplayer elements would be included, he did state several times that you would be able to at least randomly encounter other players in the world. He even likened the experience to PlayStation's Journey. That is just not true. On launch day, two players coordinated to be on the same planet in the same location and they could not see each other. 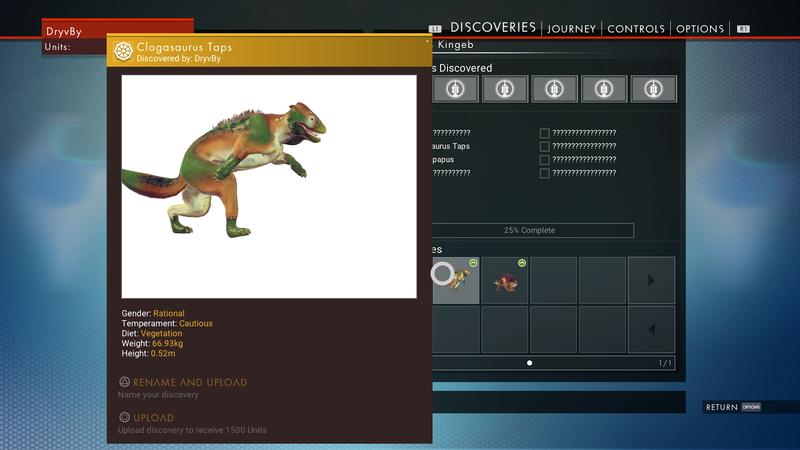 This sparked outrage in the No Man's Sky community, and I say rightfully so. So lets just clear this up once and for all: No Man's Sky is not a multiplayer game. It is a single player experience through and through. The only multiplayer “element” in this game is potentially encountering a planet that has already been discovered and named by another person. That is it. Unless those two players, and many more in the meantime, experienced a severe bug, anything mentioned about running into other players is just not truthful. It is a shame that no one at Hello Games would clarify this before accepting money for their game. On another disappointing note, if you planned to purchase this game on PC, I would recommend thinking twice before doing so. This is a console port to PC and not a very good one at that. PC gamers have reported experiencing issues with frame rate, screen tearing, and complete game crashes. 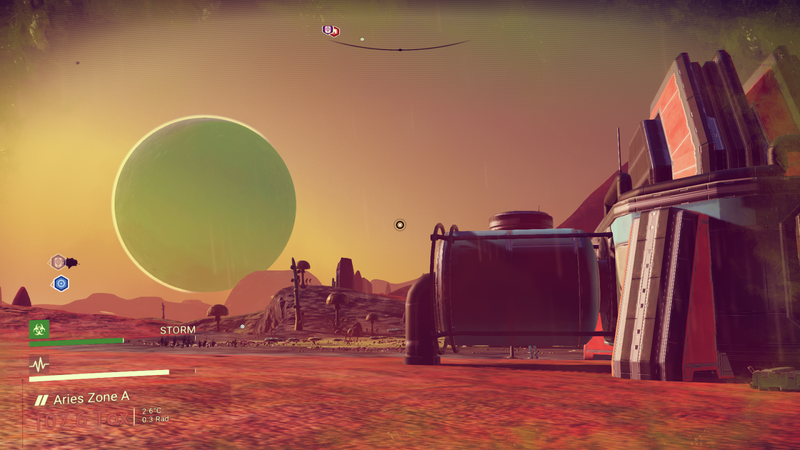 Hello Games is working on patches which will supposedly address these issues but right now the best way to experience this game is on PlayStation 4. You will have a (mostly) 30 FPS experience with a jaggy world with less crashing and an equal amount of geometry pop-in. With all the positives and negatives I've mentioned so far, I need to again address the fact that No Man's Sky was falsely advertised regarding several aspects of the game and I am not going to let that slide. It is expected that some things discussed during development may not make it to the final game. Almost every current gen title has this to some degree. But what Sean Murry promised and then delivered is on a level almost equal to Peter Molyneux. The promised multiplayer is a lie, you can not land on asteroids, there are not multiple ship classes, there are no crashed freighters on planets, and many other minor issues. This is something that should not be taken lightly. See that planet over there? You can go to it. Now, with all that being said, I can say the time I have spent with the game is fun. It still has a sense of discovery and mystery about it. No Man's Sky is a great exploration game and I have been having a blast playing it, despite its flaws and limitations. I find the people who are having the most fun in game are those who take their time to explore every nook and cranny of the planet or system their on. I hope Hello Games patches this game soon, and with more than just basic bug fixes. I can not say if you will find this game to be a let down because it depends on who you ask. I personally feel that most of what was promised was delivered. But the lack of any type of multiplayer is a dark mark on this otherwise interesting and unique game. It is not the best survival game nor the best crafting game but it does offer seamless space travel and has more depth than a lot of gamers are giving it credit for. It is a very slow-burn. PC gamers, I would recommend Starbound as s 2D alternative to scratch that sci-fi itch until Hello Games works out the issues with No Man's Sky. It is a great addition to the PS4 library, but I can not recommend it on PC until some of the bugs are ironed out.